Midwest Musical Imports would like to welcome Dr. Scott Campbell for an in-store appearance this Thursday Feb. 7th from 10am-Noon. 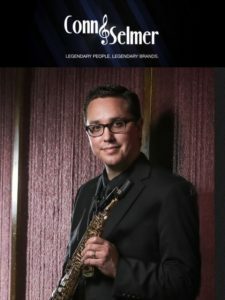 Mr. Campbell is an accomplished performer/teacher and now the newly appointed Woodwinds Product Manager for Conn-Selmer. This is a great opportunity to learn about Selmer saxophones and some major discounts Selmer is offering this year. Bio: Dr. Scott Campbell has performed or presented masterclasses in Australia, China, Finland, France, Germany, Norway, Sweden, and throughout the United States. He has performed with The O’Jays, Ben Folds, Martina McBride and appeared with various ensembles including Dallas Pops Orchestra, Plano Symphony, Odysseus Chamber Orchestra, and the Allen Philharmonic. Along with numerous solo recitals, Dr. Campbell has given world-premiere performances at the North American Saxophone Alliance Biannual conference. Prior to Dr. Campbell’s appointment with Conn-Selmer Inc. he served on the music faculties of Southwestern Adventist University and Mountain View College. In addition, he taught a very successful private studio that averaged between 80-100 private students in Texas. His students regularly achieved positions in All-State, All-Region, and All-District bands. His students have won positions into youth programs such as Honor Band of America, Greater Dallas Youth Orchestra Wind Symphony and Jazz Ensemble, and have gone on to be accepted to music programs at Eastman School of Music, Northwestern University, Peabody Conservatory, the New School, University of North Texas, Berklee College of Music, Texas Christian University, Southern Methodist University, Baylor, Texas Tech, the University of Texas at Arlington, and Interlochen Arts Academy. Dr. Campbell received his doctorate degree in saxophone performance from the University of North Texas where he served as a Teaching Fellow and has been featured as an interviewee in The Instrumentalist, Southwestern Musician, The Wave, and served several years as a busy clinician for the Vandoren company. Dr. Scott Campbell holds the position of Woodwind Category Manager for Conn-Selmer Inc. In this roll he oversees the woodwind instrument division of the company. His responsibilities include overseeing woodwind related marketing, product development, manufacturing, distribution, sales, and artist relations.